Kawakawa (Macropiper excelsior) is to Rongoā Māori what Arnica is to Homeopathy. Nearly everyone has either heard of it or used it. Easily recognised by it’s heart shaped holey leaves, and lush little-finger sized orange fruit my 3 year old mokopuna can spot it a mile off. In summer when the fruit are in season we go early morning to feast on the fruit. The trick is to beat the birds. The fruit is sweet and soft when ripe, reminiscent of pawpaw and mango but with tiny hot peppery seeds within. Not to everyone’s taste but we adore. There are so many purported uses for kawakawa, though there has not been much scientific investigation to date. Nevertheless it is undoubtedly the most used of our medicine plants here in Aotearoa. Kawakawa is an analgesic, a pain reliever. Chewing the spicy/peppery leaves and packing them on the gums or against a painful tooth will keep the pain at bay until a dentist is available. One of Kawakawa’s active ingredients is eugenol which is the main active ingredient in cloves. Eugenol is anti-microbial, anti-inflammatory and stimulates circulation which is probably why my dentist uses clove oil when he is dealing with tooth/gum infections! Once a week I endeavour a 24 hour fast During this time it is a real pleasure to cook up a kawakawa tonic and drink a few hot cups during the day. I find that it sustains me and helps regulate my digestive system. The leaves are widely used for it’s ability to help with stomach pains and indigestion and some people feel it really cleans them out, while in old times the root was chewed for diarrhoea. Different parts of a plant will often have different actions. It comes into its own as as a restorative spring tonic and a blood cleanser by supporting the kidneys and flushing the digestive system. To make a simple tonic (waiwai) bring a half dozen leaves to the boil in a litre of water. Keep covered with a lid while the mix simmers for about half an hour. Strain off the leaves and keep the liquid refrigerated. Half a cup topped up with hot water is a good daily tonic. Because of it’s action on the blood it’s not advisable to use kawakawa if you are also using the medication warfarin. Used topically in creams and salves kawakawa is unsurpassed when treating the itch and inflammation of eczema. It calms jangled nerve endings in inflamed skin conditions, restores calm and encourages healing. I use kawakawa in my throat spray and cough/throat syrup. It relaxes, soothes and can stop a simple sore throat from progressing. 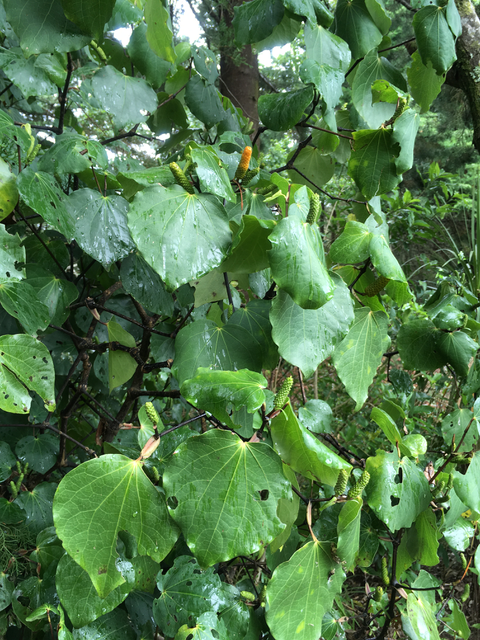 Kawakawa leaves have been traditionally used as a drawing poultice for boils or abscesses. Boil the leaves till soft, drain off the water and use the smooth side against the boil. Cover with glad wrap and a towel to keep the heat in. I’ve planted many kawakawa plants here at home. Apart from using this precious resource regularly my greater motivation is to create an environment where all can flourish. Plants, humans, birds and insects. The day I found the first self seeded kawakawa was a happy day indeed. It’s an acknowledgement from Papatūānuku that I’m on the right track and in truth that’s all I ask for. Kia ora Trish – love this kõrero about Kawakawa. Very useful! Tēnā koe e Olivia, kawakawa is such a taonga!